Town manager Gary Allanson was delighted with the way his side overcame all the obstacles put in their way to win the East Riding Senior Cup. Bridlington beat Hull United 4-2 at the KC Stadium, despite having Danny Smith sent off with 35 minutes to go with the scores level. Allanson said: “We always knew it was going to be a difficult game as we have watched them numerous times and knew how they were going to play. They are very hard working and put you under a lot of pressure by being direct. “Chris Jenkinson and Benn Lewis had both been carrying injuries and both pulled out in the warm up so we had to change things around before kick-off. “We knew they were dangerous at set pieces with their height and aggression and the long throws and if we could compete with that our quality would come through. “But you have to do stick to your beliefs and play the game the right way by passing the ball and keeping possession and gradually grind teams down with quality. 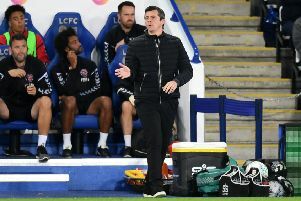 “I have said on numerous occasions we have a responsibility as managers of putting an entertaining product on to the pitch, I felt we did that last night and that comes from many training sessions of instilling that way of playing into the players so it becomes second nature. “The players were magnificent in the game, they were composed in possession and worked hard out of possession to close down and get the ball back. “In the first half we missed a cutting edge up front but because they played very deep we couldn’t get in behind, but this created a lot of space in midfield where we had a lot of possession. “Craig Hogg has had a difficult season with injuries and personal problems but he has stuck at it and stayed loyal to us and we have tried to look after him in the right way and he got his rewards last night by scoring a fantastic hat-trick. “We changed things a little at half time to tighten things up at the back and I felt we were well on top, then we changed things as we tried to push on and make our possession count, but unfortunately young Danny Smith got sent off after only two minutes on the pitch. “Danny is 19 years old, not a malicious bone in his body, a die-hard Hull City fan and was probably the biggest game of his young career. I understand the referees union will tell me that it was a definite red card by the letter of the law and it probably was, but sometimes a little common sense, the occasion, the situation, maybe needs to be taken into consideration. “The lad is absolutely gutted and it will take him a long time to get over it. “We made a real brave decision to go three at the back and keep our attacking impetus and this really paid off for us, but the character of the players really came through, their togetherness, their work ethic for each other and their will to win, the experienced players really stood up to the plate and took responsibility and that was great to see. “We seemed to play better with 10 men and created more chances but I think that came from the amount of possession we had had in the game and their physical and mental strength had been sucked out of them. “A great win and a great night. The players were magnificent and deserve all the plaudits they get, it was great to see the experienced players who have stayed loyal to the club through thick and thin get their rewards last night, but it was also fantastic for the club and the backroom staff who work their socks off for little recognition to make the whole club run smoothly.